Hidden intermediates in the benzidine rearrangement. The monoprotonated mechanism. 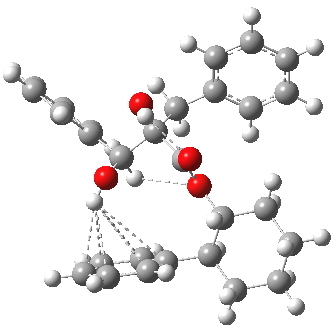 A conflation of concepts: Conformation and pericyclic. 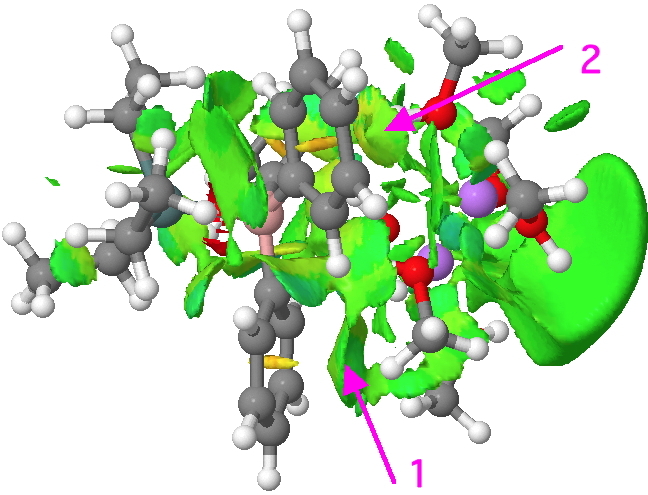 NCI (non-covalent-interaction) analysis for some π-hydrogen bonded systems. In this post, I looked at some hydrogen bonds formed by interaction of a π-system with an acidic hydrogen. Unlike normal lone pair donors, π-systems can involve more than two electrons, most commonly four or six. Here I look at examples of both these higher-order donors. Arrow 1 points to the interaction between the OH group and the diene unit below. The surface is coded light blue, which indicates a moderately strong attraction. 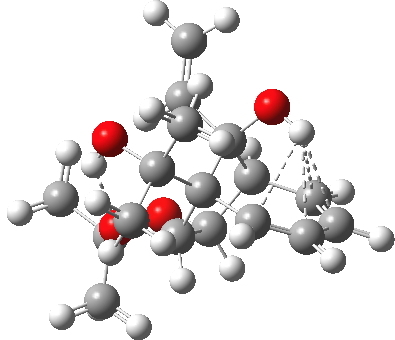 This surface is curved, and spans all four carbons of the diene, indicating it truly is a η-4 hydrogen bond. Arrow 2 points to a conventional OH…O hydrogen bond; it is deep blue (strong), and the surface is circular, η-1. Arrow 3 is a less conventional attraction, between an oxygen lone pair and an alkene, here only pale blue. Arrow 4 is a H…H zone, with pale blue immediately adjacent to yellow (weakly repulsive) and so overall this contact is probably not very attractive. Arrows 1 and 2 in the NCI surface point to the two cone-shaped surfaces comprising an η-6 hydrogen bond. It is coloured pale blue around most of the rim of the cone, but not entirely evenly. There are lots else going on which I leave you to explore. Arrow 1 is the cone-shaped NCI zone for the OH group interacting η-6 with the π-face, but rather asymmetrically and weakly (no blue, only green). 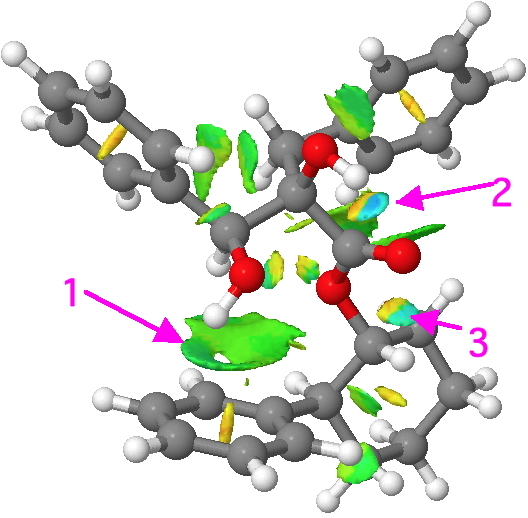 Arrow 2 is a more conventional OH…O bond, but as part of a 5-membered ring. As we saw before, these types of hydrogen bond are quite weak, and you can see this reflected in the blue attractive circle being adjacent to a yellow repulsive zone. The two cancel each other to some extent. The same is seen for arrow 3, which is a 5-ring now bearing an O…H-C interaction, again overall weak (despite the blue). To sum up, the NCI method (which has been used elsewhere in this blog) seems to be teasing out some interesting zones of intramolecular interaction in hydrogen bonded molecules. 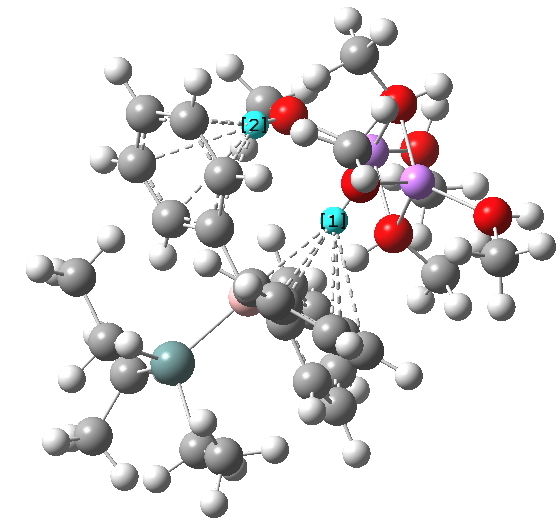 I end again with the same speculation; have any π-face hydrogen bonds that are > η-6 been discovered? This entry was posted on Tuesday, January 8th, 2013 at 2:09 pm and is filed under Interesting chemistry. You can follow any responses to this entry through the RSS 2.0 feed. You can leave a response, or trackback from your own site. 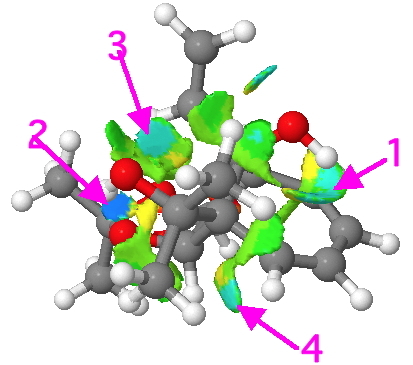 NCI (non-covalent-interaction) analysis for some π-hydrogen bonded systems. is licensed by Henry Rzepa under a Creative Commons Attribution-Noncommercial-Share Alike 3.0 United States License.